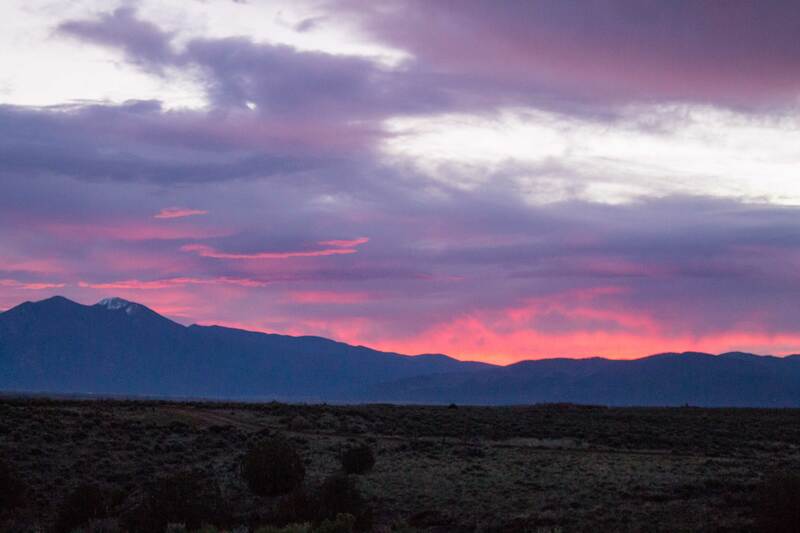 Taos changed me forever…a new part of the soul woke up suddenly, and the old world gave way to a new. My daughter had circled some places on a Rand McNally Road Atlas giving me some suggestions on where I might visit. 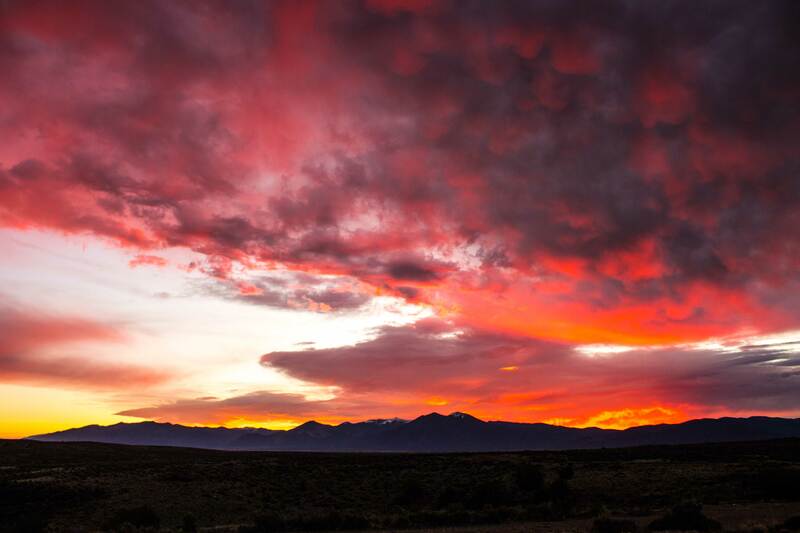 Taos, New Mexico was circled. As I turned around the last bend before town, I noticed a magnificent valley. The Rift Valley lay at the foot of the Sangre de Christo Mountains, meaning “the Blood of Christ”. The mountains and surrounding clouds turn a dark red on my sunset today. I was Thankful that I witnessed this and took some beautiful photos (enclosed). My friend Pedro added; the mountains had received their name also because Indian history dictated that “The Christ” of the Bible had also walked the earth in that region at the very same time as Israel, effectively being in two places at one time. Later I identified three religions existing in Taos-Peyotism, Catholicism, and the Sundance. Many stories can be found about prophecy in the area that the “Rio Grande” river runs right through carving down into the valley some 300 feet, forming the Rio Grande Gorge. It seems that one could see for 30 miles in all directions. A little thunderstorm 20 miles out looks like a Roadrunner cartoon as the lightning bolts dash to the ground. This is quite a contrast I thought to myself. I think I’ll just sit here until I can’t stand it and then sit a while longer. I noticed a path going down into the canyon and decided I should check it out. A peculiar thing happened at that point. It was around seven in the morning and a girl came up out of the canyon as I was entering. Now it was about 7 in the morning and it was cold to this Florida boy. She was wearing a little tank top and light sweatpants and no shoes. I nodded and began to go down. This was a long descent I thought as the path got narrower and a little harry. About 45 minutes in, here she comes past me. “Well whats going on, going back down” I asked, she said “yes, this is where I go”, and hurried by no shoes and all. A few minutes later she was out of sight. I couldn’t help but think she was hurrying ahead of me to warn someone that I was coming. What and who would need to be warned that I was coming, I thought. As I followed the narrow path down I noticed some beautiful paintings on the canyon wall. They all had one similar plant life contained in the paintings -mushrooms. Well I thought if there down here doing mushrooms this could be interesting. I had my camera after all and I had nothing else to do. Marcus Aurelius once said “We must accept whatever comes to us as it is woven into the fabric of our destiny.” I picked that quote to give me a little nudge to continue on. Well I’m sorry to report that that path got a little too crazy for me and my socks underneath my flip-flops. And besides that I wasn’t quite sure what to make of the whole thing. At any rate I enjoyed the process and after a while went to check out the town. Those mushroom paintings had me thinking a little I must confess. Why do I say that? Well I had been on the spiritual journey for some time now. I had taken a long look at many spiritual practices and one thing in common that I had found was that there was a different world, here, right in our presence that one could see. Christ had said: The kingdom of Heaven is laid out before man though he see’s it not. The Course in Miracles stated over and over that if one could loose this world from all he thought it was he could see a different kind of world. I had studied and practiced that course for three years now night and day. I would have to admit that I had found a deep peace and I might add that I never felt lonely. I had been on my motor home trip for over a year now and not once did I feel alone. I indeed saw the world differently. One might say that I saw the insanity of what we humans were doing to the planet and ourselves. But was this what was spoken of in the teachings. I have to admit here that I had a deep desire to help heal the world. Was three years of relentless study and meditation enough to heal “my own world”? Did I have to claw and scratch my way back to my original self and had I peeled enough blankets off in order to pierce the veil that closed my eyes. Many speakers had mentioned that they had been able to see everything as “one” if only for an instant. What could I do? Eckhart Tolle had once said “Enlightenment must be sought like a drowning man seeks air and on the other hand it is pure grace and there is nothing one can do”. All of it was a paradox. Jesus had said to keep the fire burning for no one knew when the master was returning -paraphrased. Well on my journey I had come across many a teacher that had used Mushroom, Peyote, LSD and other Psychedelics in order to reach this state I speak of. People like Terence McKenna, Ram Dass, Timothy Leary, Aldous Huxley and on and on. You see Psychedelics were studied for years before the government had shut it down. Recently new Scientist and physicians had been granted permission to do studies with DMT and other studies. Ayawaska was known for thousands of years by the Shamans of the Amazon Rain Forest to cure people of all kinds of ailments. I Know this may seem crazy to you but at times I wondered if Jesus had possibly used drank a little “mushroom tea”. Either way I was Hell bent for the promise land. Even if it was the definition of an oxymoron. I was on a journey and I considered myself an explorer, so why not explore “this”. So with all that said I got on the computer and looked up Shamans in the area. I found the “Peyote Way Church of God in Arizona”, I gave them a call, three hundred and fifty dollars and a three month waiting list. Interesting I thought. I am not the only one looking at this. I found a place called “Shamans Rest “nearby and called -no answer. I called them twice and left messages and never heard back. 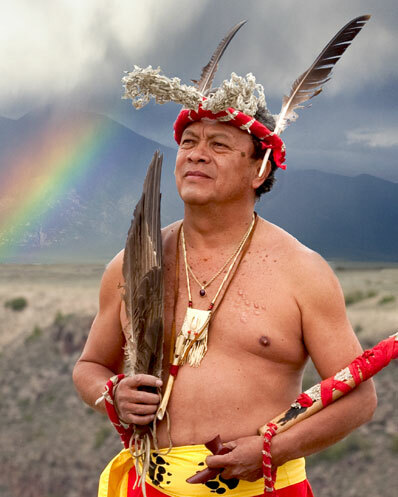 Then I came upon “The Sundancer” a local Shaman here in Taos. Well lets give him a call. He answered and we spoke for a while. There was to be a Sweat Lodge ceremony the next day in order to heal a man with PTSD. He invited me and I accepted and here we go I thought. I wondered if we were to smoke or drink something in this event and thought, I’ll just show up and see. He had told me it was to be a 7:30 and that I should fast. I found out later that it was 7:30 in the morning so the fast was not difficult. I began to wonder how the whole thing might go. The Sundancer -Pedro Gonzalez was pictured on his website in full garb. There was a little lightning bolt and an Eagle on his costume. In my attempt to see this different world I spoke of, the thought that the lightning bolt might be significant being that I had just witnessed a lightning storm. That’s just an attempt to read something into this -I thought. I had visited him at his office and he had shown me his teacher, a picture of an old Indian man. I was fascinated and Pedro was extremely nice. He stated that this was not a coincidence that I had called right at that minute. His wife had shown up at the office and we had talked for a while. She was into meditation and later I would learn that she was leaving for India soon for two months to engage in her spiritual practice. So with one phone call I was introduced to two people that were seeking the very same thing I was. Although experiencing two seemingly different paths to the same goal. “Watch with the spirits eyes” I thought. Don’t use your body’s eyes for this experience, I reminded myself as I arrived at the ceremony. I didn’t know it at that time but it would be pitch dark in the Lodge. There were just the two of them there as I arrived sitting by a large roaring fire. The fire contained sixteen or so lava rocks buried beneath the logs. A Buffalo skull sat with a circle made of Tobacco. In the middle of the circle was a cross symbolizing North, East, South and West. Mr.Sundance handed me a pack of Tobacco and said to give it to the medicine man when he arrived as a sacrifice. This I thought was interesting because, I was supposed to arrive with a prayer in my heart. The one prayer I thought of was to quit smoking. The brand of Tobacco was one of the one’s that I currently smoked. Three peace pipes leaned against the Buffalo Skull. Don’t tell me we are smoking Tobacco I thought. I was hoping for mushrooms or something other than what I was trying to quit. As the guest arrived I saw that they had several children in tow. Dark skinned with long coal black hair, beautiful children and very well behaved. Each of us was to go and take a cloth and some additional Tobacco and make a little prayer sock I am going to call it, because I cannot remember the ceremonial name. Once that was done we all gathered around in a half circle to receive some instruction about what was to take place. I am told that Europeans introduced alcohol spirits to the American Indians and the Indians provided Tobacco in turn. In addition to the inhumane treatment by the white man the Indians soaked themselves in this new found liquid spirit . 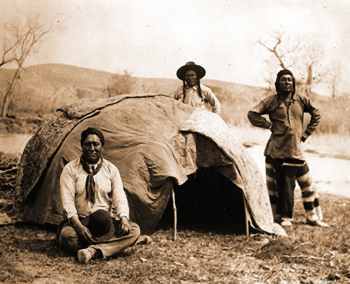 In order to purify themselves and return to traditional spiritual ways the Sweat lodge was invented for purification, to get answers and as a spiritual refuge. Our official medicine man “Howard Badhand” was to call forth his spirit guide that he had named ET. Then any questions that were to be asked could be answered by ET. As we entered the sweat lodge and attempted to get comfortable, I say attempted because I had always had a problem sitting Indian style, Sundance started pitchforking the Lava Rocks into a round dug out area in the middle. These were big stones and Sundancer was grunting and fighting to get them in there without burning one of us. So the flap was closed and the ceremony began. I will have to say that the chanting and singing that Sundancer and Badhand performed was so authentic that I was no task at all to see myself back 500 years sitting in a Tee pee. Well in truth it was authentic, I mean these were the chants and these were the Lakota Indians for Gods sake. After many songs and many a scoops of water poured over the Lava Rock many a sweat rolled off all of us. I can say that it was enjoyable accept that I could not get comfortable and finally just laid on my back. So Mr.Extraterrestrial was summoned, questions were asked and answered very professionally and concisely. One thing I want to point out just so I and ET get some credit is that around September of this year a Comet or Asteroid is to come and cause widespread panic on the earth. “Don’t say I didn’t warn ya”. When it happens, “remain calm and carry on -to the bar and start drinking – just kidding – do not remain calm. Now you might want to know what ET’s advice was. He said, “ just chill, it’ll beaweright”. Pretty much what I said too. We smoked the Tobacco pipe and I was grateful for that, being this lasted some four hours and I was having a “Nic-fit”. It was a great experience -really. I thanked them all as Howard Badhand told me of his CD’s that he had for sale on Amazon and so forth. I felt bad that I had not brought some money to give him and this escalated somewhat as he mentioned the CD’s for the second time. I left there, and a story that Ram Dass had mentioned came to my mind. Ole Ram Dass had searched all over the States and had gone to India on a mission he had explained as “ I wanted to find someone who Knew”. He stated that he wanted to look into someones eyes and know they knew the truth. Someone like Buddha or Jesus, any enlightened master. This is what I felt also. I wondered if my past had just been a little too wild to be “astonished” with anything any more. I wanted my proverbial socks to be blown off and this had been my prayer. I said “Jesus, if you are real and it is true what you have told me -that there is only one Son of God, and I am that – then I want to experience it dammit. I am going to draw a circle in the sand and sit right in the middle of it until God shows himself to me. I had been told in the Course that “Infinite patience produced immediate effects”. I knew I couldn’t sit in my circle and think, I’ll stay here for a thousand years, I had to act as if I was going to be there for infinity. I had tried this several times when I was a child in my bed at night. “Just show yourself, I won’t tell anyone” I always prayed. He might have shown up but I was always asleep if he did. But then again, why not engage a little help from the plants. I mean who made the plants? If for thousand of years different cultures had summoned the teachings of the plants why not me and why not now. I had a sneaky suspicion that the Aztecs and the Egyptians had used the plants to come by all their prophesying and building those Pyramids. How in the Hell could they have known about all those planets and that the “Kali yuga” cycle started in 2012 and on and on. It was the plants dammit and I was gonna find out for myself. I had taken my spirituality as high as I thought I could and I was going to jump off on a “Peyote Button” and catch a ride to the next dimension. No one would ever hear from me again. I felt like I needed to be a little on the down low even though it was legal here because it was part of the Indian’s spiritual practice, but I was not an Indian as far as I knew. I called Pedro the “Sundancer” and invited him to lunch. As we sat down to lunch Mary showed up and I wondered if I should mention the Peyote. We talked and as we did I asked Mary about her meditation practice and coming India visit. I was amazed to find out that she had lived in Hawaii for 10 years. I had just thought about selling my motorhome and going there myself. This was getting interesting. She had also traveled all over Asia in the business of importing items for sale here. As we talked I mentioned that I was reading a book called “Vagabonding” and that the writer had stated that he had been all over the globe at a cost of only a few dollars a day. He worked himself across the world for years. She stated that this was true for her also, meals were about a dollar and there were countless places to stay and guidebooks and the internet to well, guide you. I started to get excited and wondered if this was the new world I was looking for. At that point I noticed the huge wall in the restaurant where a mural was painted. This mural seemed to depict a local mountain and had a great big serpent coming out of the mountain that looked like a Dragon. “Is that Mescalito Pedro” I asked. No, no that is the Bloom Serpent, he represents the fire of the bloom and went on to tell me things I cannot pronounce. Is that the same as the “Angel Fire”? He said “No you silly white man”. I was trying to work Peyote into the conversation. When one does Peyote the active ingredient is Mescaline. When you trip you meet “Mescalito” as some call him. He is described as a protector spirit. In the world of Shamanistic practices there are ally’s and protectors. “Mescalito” is described a spirit that can show you your faults and help you find your purpose in this illusion of a life. Now I really wasn’t interested in finding more faults in myself and adding anymore guilt to my basket. I had been trained that “guilt” was a killer and that our unconscious guilt was where all of our physical pain and unhappiness came from. Never the less I was willing to risk this in order to get some direction and have an “Out of this world” experience at this point. As Pedro and I got into the car I mentioned that I would like to do a spirit walk, as they call it , with Peyote. Pedro said he would look into it for me and made a phone call right there and then. By 11:AM the next day I had not heard anything still. Patience my boy I told myself. I decided to take another walk around the town of 5,700 people. I had noticed several dogs around town, big dogs almost like wolves with no collars on. They were pretty rough looking dogs and I would see them trotting right down the roads and through parking lots. I enjoyed this as back home we have all those stupid leash laws and such. “Just let ‘em run” I say. As I was walking a door flung open and a lady chased out what seemed to be a herd of little Chihuahua like dogs. They scattered in every direction at the end of her broom. “And Stay out” she said and then laughed. I had my dog “Mia” with me for the first year of my trip and had come to really love her. I thought to myself one day “me and that Dog are one”. I could just think something and she knew and was ready. In looking at these dogs I thought poor little dogs, there gonna get ran over. I tried to call on over and they just laughed and ran down the street, well, like a pack of Mexican dogs. I saw an awful lot of backpackers and they looked very tired. I thought about my luxury accommodations and how I was seeing the land in pretty much total comfort. Yes, it was cold some nights and one had to forgo a shower at times, but all in all I slept in my own bed every night and woke up to wonder “where the hell am I” which I loved. . I thought sometimes -It’s just like time travel. I go to bed at night and each morning I don’t know where I am until I look outside. Let me tell you being in this town was true time travel. Except for the Ace hardware this could be the 60’s. I later found out that Ram Dass himself had a temple here and I vowed to visit it. This is where the backpackers were all headed because they gave out free meals. Now if ole’ Ram Dass did a bunch of Psychedelics and he had formed a temple and was feeding people, they couldn’t be all bad. I decided to sit down and learn me a song on the guitar. Maybe I could even play it for Mescalito if I could ever find that Cactus.